> We’ve waited a long time for this. The Brewers finally made it back to .500 (71-71) with their 5-0 win over the Braves tonight, and maybe now they can take it one step further. Marco Estrada was stellar, going 6 2/3 shutout innings while giving up four hits. He walked one and struck out six. He gave up a few near-home runs that were caught about as close to the wall as you can get, but it doesn’t matter much as long as they were outs. Tim Hudson looked on his game after giving up a first inning home run to Rickie Weeks. After the second inning, he didn’t allow another baserunner until the sixth. But his wheels fell off in the seventh. Hudson gave up back-to-back singles to Aramis Ramirez and Jonathan Lucroy to start the inning. Then, two batters later with the bases loaded and one out, Jean Segura beat out a double play ball to drive in a run. That wound up costing the Braves, as Taylor Green and Norichika Aoki hit back-t0-back RBI singles to extend the lead to 4-0. Then, in the eighth inning, Aramis Ramirez hit a mammoth solo home run, his 23rd of the year. > Corey Hart was out of the lineup again with his foot problem. He’s going to get custom foot support tomorrow to “ease the pain,” and he should be back in the lineup before long. > The Brewers extended their player development contract with the Nashville Sounds, their Triple-A affiliate. The deal runs through 2014. > Ken Rosenthal suggests that the Brewers need to sign a starting pitcher and fix their bullpen problems this coming offseason. In my opinion, the SP market is going to be so bad that the Brewers might as well stick with the prospects they have and see what they can get; they’ve shown that they’re ready to perform at the big league level. But the bullpen definitely needs to be addressed. 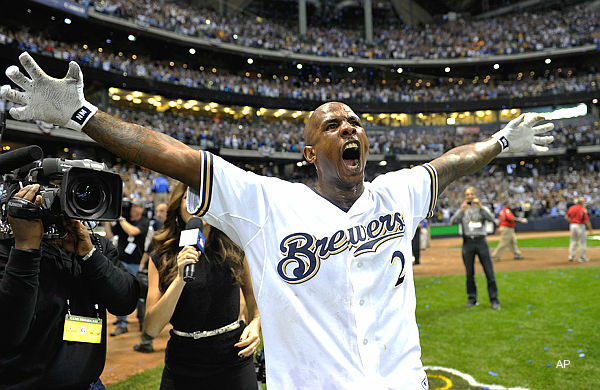 > This is the first time the Brewers have sat at .500 since April, when they were 9-9. Yeah, it’s been awhile. > After starting the year winless, Estrada has three wins in his last four starts. > Weeks had one career hit against Hudson coming into the game, but recorded two against him tonight (the home run and a triple). Weeks also had the only hit against Hudson in his last start against the Brewers, a one-hit shutout in May of 2011. > The Brewers had to have this game, and, after an amazing late comeback, it looked like they were going to get it. But, they couldn’t bring the momentum into extra innings, losing to the Cardinals 5-4 in 10 innings. The Cards jumped on Shaun Marcum right away in the first inning, with home runs from Matt Holliday and Carlos Beltran within a span of three batters. Matt Carpenter gave the Cards another in the second inning on an RBI double, and memories of the Brewers’ last NLCS game in 2011 were brought back. The only two Brewers runs came on a wild pitch that allowed a run to score in the second inning and a Jean Segura RBI single in the fourth. Fast forward to the ninth inning. The Cardinals brought in their flamethrower, Jason Motte, whom the Brewers haven’t been able to touch since he was put into the Cards’ closer role. But today was a different story. Two batters after a Segura double, Norichika Aoki hit a game-tying homer on a 99 MPH fastball from Motte. After that, I thought the Brewers were going to win for sure; everything’s been going our way lately. But not today- Kameron Loe gave up the walk-off single to Allen Craig in the 10th inning, and that was that. > Two out of three in St. Louis is usually good for the Brewers, but they desperately needed the sweep today. The Brewers don’t have any more head-to-head match-ups against the Cards for the rest of the year, and the schedules don’t exactly go in the Brewers’ favor either. The Cardinals get to play 12 of their last 22 games against the Padres, Pirates, and Astros, while the Brewers still have series against the Braves, Nationals, and Reds left. So I’d love to see the Brewers do what the Cards did down the stretch last year, but I’m not going to get my hopes up. > Ryan Braun and Corey Hart each had to leave the game early today. Braun has a wrist problem that’s been lingering the entire season, and Hart had a mild sprained ankle. Neither are considered very serious. Logan Schafer took over for Braun in left field, and Travis Ishikawa came in to play first base. > The Brewers claimed Miguel De Los Santos off waivers from the Rangers. They had released him on Friday. De Los Santos, a left-hander, put up a confusing 5.22 ERA for the Rangers’ Double-A affiliate this season. The reason I say confusing is because Baseball America thought De Los Santos had the best change-up in the Rangers’ organization prior to the season. 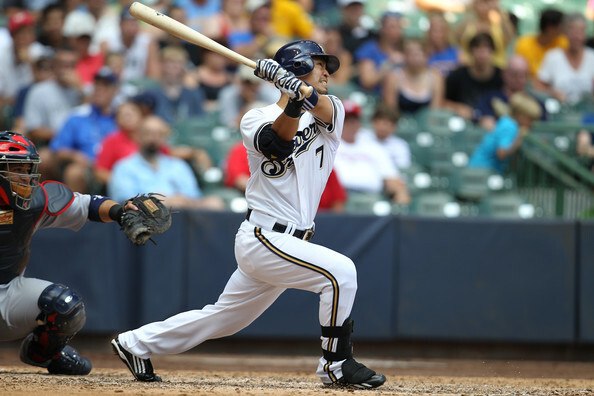 The Brewers now have two De Los Santos’ down on the farm, having acquired Fautino De Los Santos from the Athletics in exchange for George Kottaras back in early August. > Mark Rogers said he isn’t ready to be shut down. Neither am I. 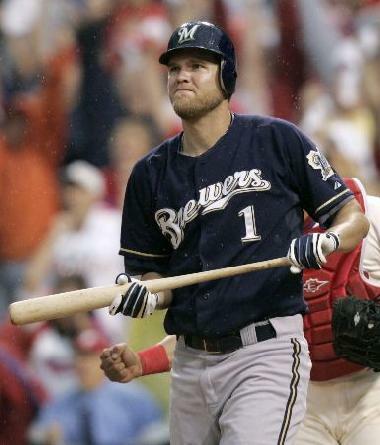 > Today is the 20th anniversary of Robin Yount’s 3000th career hit. > Zack Greinke got the win for the Angels tonight, going seven strong against the Tigers. > Brandon Kintzler threw two scoreless innings. But I find it strange that he doesn’t have a strikeout in the Majors yet this year, especially with the kind of stuff he has. > Segura went a perfect 3-for-3. He’ll need to put together a good stretch here if he wants to prove he can be the everyday shortstop next year. I didn’t get to see much of today’s game. Stupid day games during school… And what makes it worse is that the Brewers never win while I’m at school. The Brewers fell to the Cubs today, 7-1. That means the magic number will remain at three for the time being, while we wait for the outcome of the Cardinals-Mets game (the Mets are currently winning, 4-3 in the third inning). 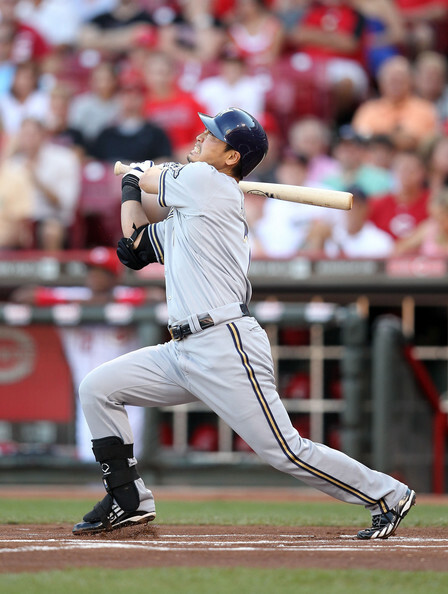 Anyway, today was the Brewers’ final road game of the season, and it did not go well. 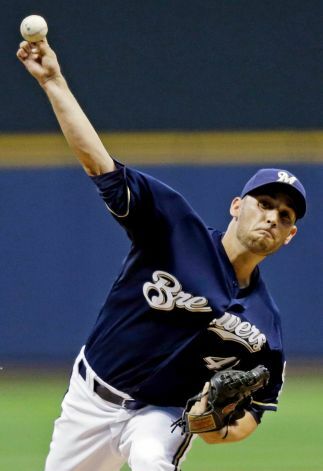 Matt Garza threw a complete game, despite some shaky defense from his team in the ninth inning. Garza became the fifth pitcher to go the distance against the Brewers this year, the others being Tim Hudson, Jaime Garcia, Cole Hamels, and Chris Carpenter. Randy Wolf did not have a good start, going six innings while giving up six runs on 10 hits. He walked one and struck out five. Now, I’m not one to make excuses, but it was obvious Wolf’s start took a turn for the worse after he was hit in the left forearm (his pitching arm) while trying to lay down a bunt in the third inning. He was cleared to stay in the game, but Wolf said afterwards that the injury affected his cutter. The biggest blow of the game came in the sixth inning on Marlon Byrd’s three-run homer that broke the game open for the Cubs. Coincidentally enough, the pitch Byrd hit out was a cutter from Wolf. According to Mike Bauman of MLB.com, the NL MVP race is now a two-horse race between Ryan Braun and Prince Fielder. I was hoping that someone wouldn’t say that, because now it’ll probably jinx both Braun and Fielder, and Matt Kemp or Justin Upton will end up winning. Out of those four, Braun is my choice (not because I’m biased, simply because he’s been the most consistent out of them). Kemp will for sure get votes taken away from him because he’s on a non-contending team in the Dodgers (that’s just how the MVP race works). And I don’t know about Upton. I know he’s having a great season, but for some reason there’s just something about him that makes me think he’s not going to win the MVP. There’s also been talk recently of Albert Pujols winning the MVP, but I just can’t see that happening this year. He’s finally over .300 (he was hitting .304 to begin the day) and he leads the league in home runs, but his RBI total is down. Before last year, I would have also said that he was injured for two weeks, but Josh Hamilton was injured for nearly a month and still won the AL MVP in 2010, so I guess I can’t use that excuse anymore. But again, I don’t see Pujols winning it this year (I don’t even think the Cards making the playoffs could help at this point). After ANOTHER September off-day tomorrow, the Brewers will start their final homestand of the year on Friday, and probably clinch the division in front of home fans, hopefully against the Marlins in the first series. Yovani Gallardo (17-10, 3.60 ERA) will go for the Brewers, and he’s coming off a 13-strikeout performance against the Reds his last time out. He’s struck out a total of 25 batters over his last 13 innings, and is now in fifth place for strikeouts in the NL. And I thought his strikeout numbers were down this year… Anyway, Gallardo has crushed the Marlins in his career, going 3-0 with a 1.69 ERA against them. The Marlins will counter with Chris Volstad (5-12, 5.13 ERA), who, in my opinion, really hasn’t pitched as bad as his record and ERA show. He’s been victim of low run support, especially lately. Volstad is 1-1 with a 1.86 ERA in his career against the Brewers.